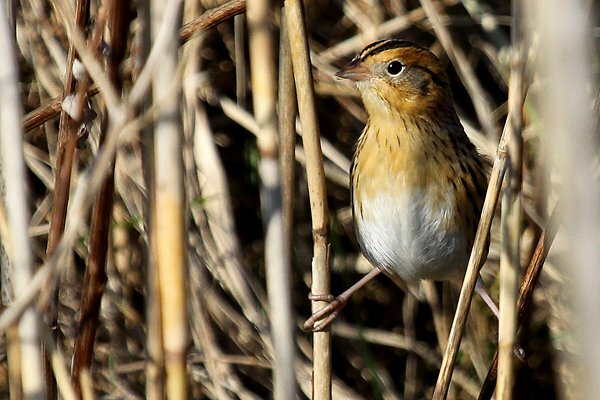 There is no better way to see a life bird than by finding one yourself in one of your favorite local patches. Yesterday I was scouting for the Queens County Christmas Bird Count at Edgemere Preserve, a capped landfill out on the Rockaway Peninsula, and was having a grand old time. Already I had dodged the pack of wild dogs (seriously), spotted a flock of American Pipits, sorted through a huge flock of Snow Geese, and flushed four Eastern Meadowlarks and a Wilson’s Snipe. 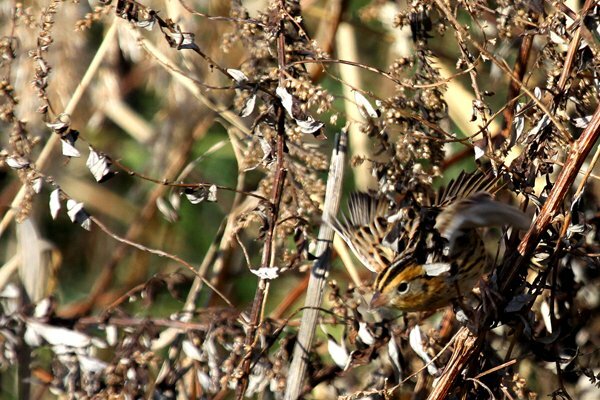 Then, while walking along a phragmite-lined ditch, a small sparrow flushed, flew a few feet, and dropped back down. I immediately knew it wasn’t one of the usual Savannah Sparrows that populate the old landfill. But would it give me a look? 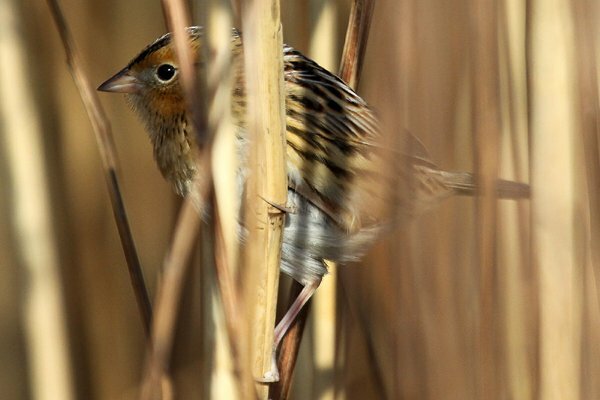 A short spish convinced the bird to pop up and the orange face immediately had me thinking Saltmarsh Sparrow or Nelson’s Sparrow. But this bird, which let me study it at my leisure as it went about its business, didn’t fit either species. 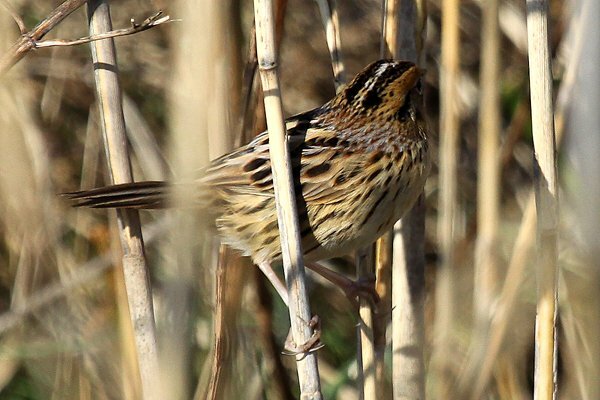 The streaking on the chest wasn’t diffuse enough to call it a Nelson’s Sparrow and there wasn’t enough streaking to make it a Saltmarsh Sparrow. And, wait a second, it had a pale median crown stripe, something that neither Nelson’s nor Saltmarsh should show. 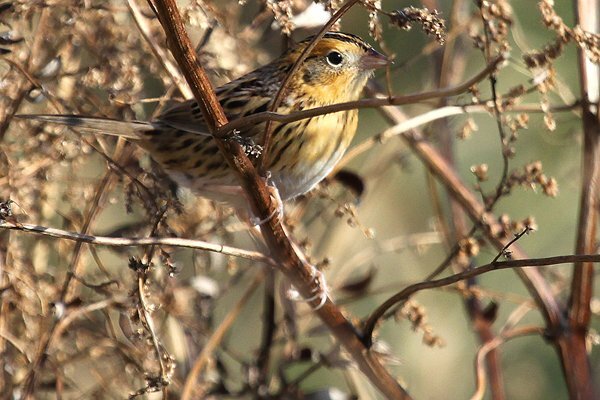 Did I have a Le Conte’s Sparrow? Having never seen a Le Conte’s Sparrow before I took my time with the bird, taking lots of pictures and trying to remember every single detail of the bird. And, once I was sure, I realized I had another puzzle to figure out. Could I report the bird? You see, Edgemere Preserve is kind of in a legal limbo. It is not officially park land yet and it is controlled by the Department of Sanitation, which burns the methane produced by the decomposing garbage to generate electricity. Though I have birded there quite a few times over the last several years without being hassled I knew that others that had tried to get in had been told to leave. If I reported this rarity to the general birding public it seemed likely that the typical mob scene of twitchers would appear which would surely draw the attention of the Sanitation Department and might even force them to kick people out, which would mean no Edgemere Preserve coverage for the Christmas Bird Count which would likely mean no pipits, no snipe, no meadowlarks, and no Le Conte’s Sparrow for count day. That would be a disaster. I called Seth Ausubel, my frequent birding buddy and fellow coastal-Queens-sector-Christmas-Bird Counter, and discussed the issue. He agreed that I shouldn’t make the bird public until after we covered the area for the Christmas Bird Count, which is why this post is going up now. But I wanted to make sure I had some witnesses, so I texted Anthony Collerton, New York State Big Year nutjob, who was birding Montauk, and Andrew Baksh, fellow Queens lister, who was birding in the Bronx, and let them in on the secret. In the meantime, Seth contacted Bob Dieterich, who leads our coastal sector for the Christmas Bird Count and was also scouting our area, to let him know. I left Edgemere and checked out the coast until I heard from Bob and then I went back to Edgemere, met Bob, walked out to the ditch, and found the bird again. 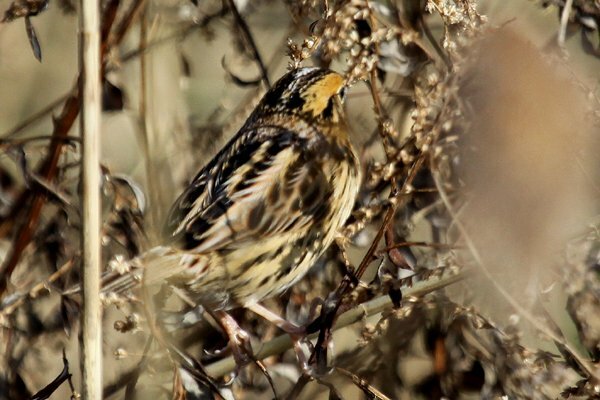 Bob is a careful birder and pointed out several field marks that seemed slightly inconsistent with Le Conte’s Sparrow, especially when looking at his Sibley, which portrays an adult bird in fresh breeding plumage sans eye ring. But we were definitely not convinced it was a Grasshopper Sparrow or a Henslow’s Sparrow, which are the only other Ammodramus with a pale median crown stripe that this bird could possibly be. Then Andrew arrived with his friend Andrea, Bob left, and we headed out and found the bird again. After hearing Bob’s concerns about the bird we observed it even more carefully, took lots more pictures, and hemmed and hawed but none of us could make it into anything but a Le Conte’s Sparrow. In the meantime I had been texting Anthony updates, and he was anxious both about the bird sticking and about it being a species that he actually needed for the year after driving two hours in from Montauk. Before Anthony showed up Andrew confidently declared that the sparrow could be nothing but a Le Conte’s Sparrow, which I agreed with but was relieved to hear him say out loud, and Anthony confirmed the identification once he arrived. Andrea, who is somewhat new to the world of birding, got to hear much more than I think anyone would ever want to hear about Ammodramus sparrow identification. In retrospect I need not have worried. 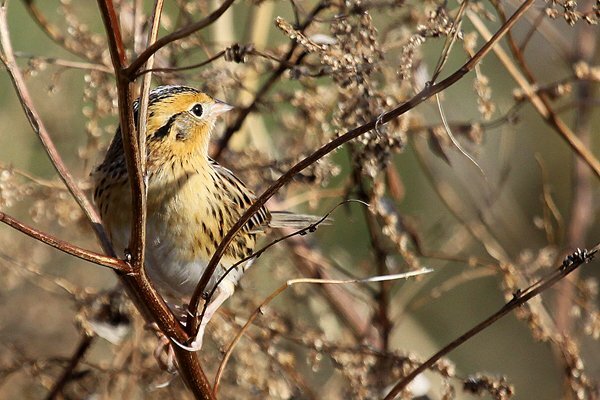 I am sure those who are familiar with Le Conte’s Sparrow are looking at these pictures and thinking to themselves that we were crazy for trying to turn it into something else. 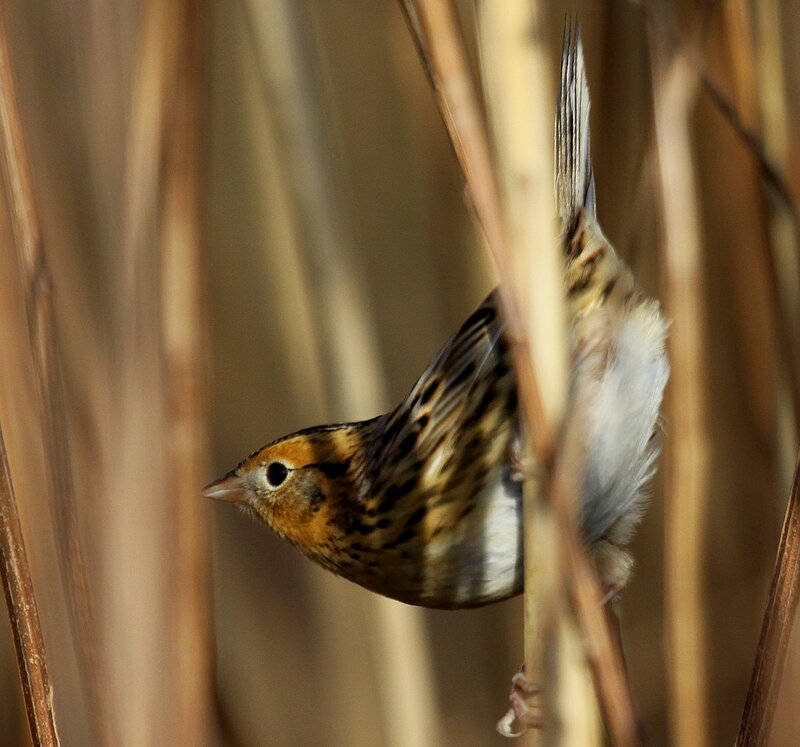 But it is hard to identify a bird you have never seen, especially when there are several similar species, and calling a rarity like a Le Conte’s Sparrow takes some confidence, which, considering some of the times I have been momentarily fooled by a bird, is lacking of late. If you decide to go after this bird please be aware that the legality of being on the capped landfill at Edgemere is murky. There are no signs saying to stay out but on occasion people are made to leave. Also, when I mentioned wild dogs above I was not kidding. There is a pack of five sizable dogs that are very aggressive and possibly dangerous. Don’t go alone unless you want to risk a mauling. Still want to go? Get out to the Rockaways via the Cross Bay Bridge and head east on Beach Channel Drive. Take a left on Beach 51st Street (after passing a housing project on your left) and at the end of Beach 51st Street continue straight (be careful, the entrance has a kind of big bump). Drive past the sanitation facility on your right and where the road ends take a right. This will put you behind the sanitiation facility. Drive up the gravel road that goes over the top of the landfill that is directly in front of you. The road will curve to the left, then to the right, and then again, slightly, to the right. Shortly after that slight right curve you should get as far off the road as you can and park. On your right side, looking southeast, you should see a couple of berms leading directly away from you. Walk out along those berms until you come to a little ditch lined with phragmites. Walk along the ditch and look for the sparrow. Each time the bird was seen it was seen in the ditch. I’ll bet the bird is still there – not the best weather for sparrows today. Absolutely. Who is going to brave the wild dogs tomorrow and find it? Wow! Nice lifer find and great pics! Congratulations on a lifer! A well written an enjoyable blog. I was at the edge of my seat and thankful that the dogs did not attack. Great find. Congrats…. this brings your Queens list to what? __________. And, Rich, I am at 297 plus three “uncountables.” The whole list is here. Wow. And great pix. Congratulations. I’m a big proponent of this sparrow, although I’ve only seen a handful. Awesome find. Pretty easy to ID, especially when you get crushing photos like this! I encountered the wild dog pack about 6 years ago on my first visit to Edgemere, tempted out to the landfill by Bob’s CBC finds. We faced off on top of one of the hills. I reached into my pack of urban nature skills and came up with my mother’s surefire way to deal with crazy dogs. “Go Home!” I told them strictly, pointing in the opposite direction. And they went. And then saw some great birds. But, I will never go there alone ever again. Are Introduced Snakes in Florida Learning to Eat Eggs?